Each Cedar Badge participant receives a Cedar Badge participant guidebook and neckerchief. Upon satisfactory completion of the course, each participant is awarded the coveted Cedar Badge patch. The Scout, BSA Cedar Badge program uses the Patrol Method in a Scout Camp setting to teach leadership skills and help scouts become effective youth leaders within the Boy Scout program. Additionally, Participants are taught and use traditional Scoutcraft skills in various interpatrol activities and competitions. Capped off with an outpost hike and the popular "WizBang" games. Scouts, BSA Cedar Badge offers everything a scout needs to become an effective leader. Building on the Scouts, BSA CB and Varsity CB programs, Venturing CB/Kodiak is the pinnacle of the Cedar Badge experience! During the Kodiak Trek, Venturing Crews, learn to incorporate highly developed leadership abilities with advanced communication skills in team building activities, all while hiking the trails and floating the rivers of Idaho's beautiful mountain wilderness. Who plans and conducts Cedar Badge? The Cedar Badge Board of Directors, comprised of 24 young men and young women, lead and directs, the program. 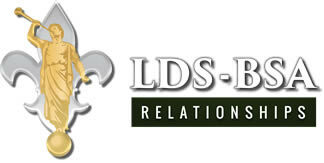 The balance of the Cedar Badge staff is selected and trained by the Board of Directors. Scouts who have attended and successfully completed the Cedar Badge program can apply to be on staff. The Cedar Badge program is overseen by a staff of carefully selected and trained adult leaders. How do Home Units benefit from having Scouts attend Cedar Badge? Scouts have a positive Scouting experience with 350 to 500 other Scouts. Scouts return to their home units more excited and knowledgeable about Scouting. Scouts learn leadership skills that can be applied in home units. Scouts learn to work with others including people they have never met before, to accomplish tasks and activities. Scouts can obtain and realize the value of wearing scout uniforms. How do Scout Leaders benefit from having Scouts attend Cedar Badge? Scouts set goals while at Cedar Badge that must be completed at home and in their home units. Many of these goals are actions that will improve the attitude and skills of your home units. When and Where does Cedar Badge happen? 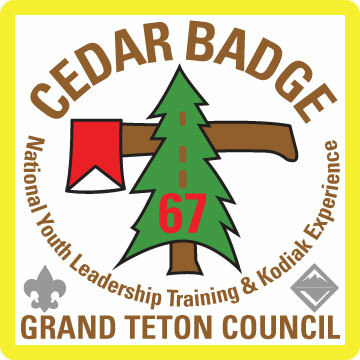 Cedar Badge is held at Treasure Mountain Scout Camp at the base of the Grand Teton Mountains, during late June of each year. In August, a third course is held at Island Park Scout Camp as part of Tall Timber. It starts on Monday morning and completes with graduation mid-day on Saturday. Parents and others are not invited to visit during the course, but are encouraged to attend the graduation (times vary so check with your course). Scouts must remain in camp during the entire course, from start to finish, to complete the course. Adult leaders or parents need to provide transportation to and from Cedar Badge. How do Scouts Qualify to attend Cedar Badge? Be a First Class Scout by Cedar Badge time. Provide and wear a full Scout uniform (field uniform) including pants and socks. Have a prior week long or other camping experience. Cedar Badge is not for first time campers. Provide a completed Health and Medical Form. Be recommended by their unit leader.